Ultraviolet disinfection is a proven and highly efficient method for water purification without the use of chemical additives. Disinfection destroys pathogens such as E. coli bacteria making the water safer to consume. The invisible radiant energy in the ultraviolet region of the spectrum (254 nanometers) is lethal to microorganisms. This energy is supplied by the UV lamp, which is made of quartz glass. The lamp is protected from the water by a tube made of quartz glass. Quartz glass is used because it allows 90% transmission of ultraviolet light. 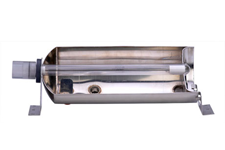 The water is exposed to the energy when it passes through the 304 stainless steel chamber around the quartz tube.